With an acceptance rate of 77%, John Brown University may seem like it isn't overly selective, but admitted students tend to have grades and standardized test scores that are at least a little above average. To apply, students can fill out an application online. Additional required materials include high school transcripts and scores from the SAT or ACT. While most students submit ACT scores, both tests are accepted by the admissions office. Campus visits are not required, but are always encouraged for any interested students. 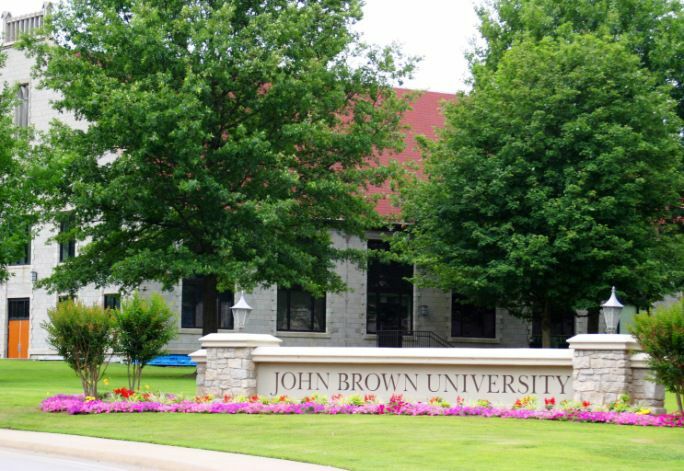 John Brown University is a Christian University located on a 200-acre campus in Siloam Springs, Arkansas, a town in the northwest corner of the state. Fayetteville is about 30 miles to the southeast. The university has a Christ-centered mission, but the school admits students of any faith. Students come from 39 states and 45 countries. Undergraduates can choose from 45 majors and 50 minors. High achieving students should look into the Honors Scholars Program with its great books focus and hands-on approach to learning. JBU academics are supported by a 13 to 1 student / faculty ratio and an average class size of 20. In athletics, the John Brown Golden Eagles compete in the NAIA Division I. The university fields six men's and six women's intercollegiate sports. Popular sports include soccer, cross country, basketball, tennis, golf, and track and field.